Dehesa de Los Llanos Semi-cured Cheese: ivory white, creamy texture, clean aroma with toasted and nutty hints. It has a lingering, intense and elegant taste. World Cheese Awards Gold Medal in 2013, Silver Medal in 2010 and 2007. Dehesa de Los Llanos Cured Cheese: dark ivory in colour, has a slightly creamy texture and a clean lactic aroma. Its taste, well-developed, intense, elegant and long-lasting. World Cheese Awards Bronze Medal 2010, 2009, and 2006, Gold Medal 2007. 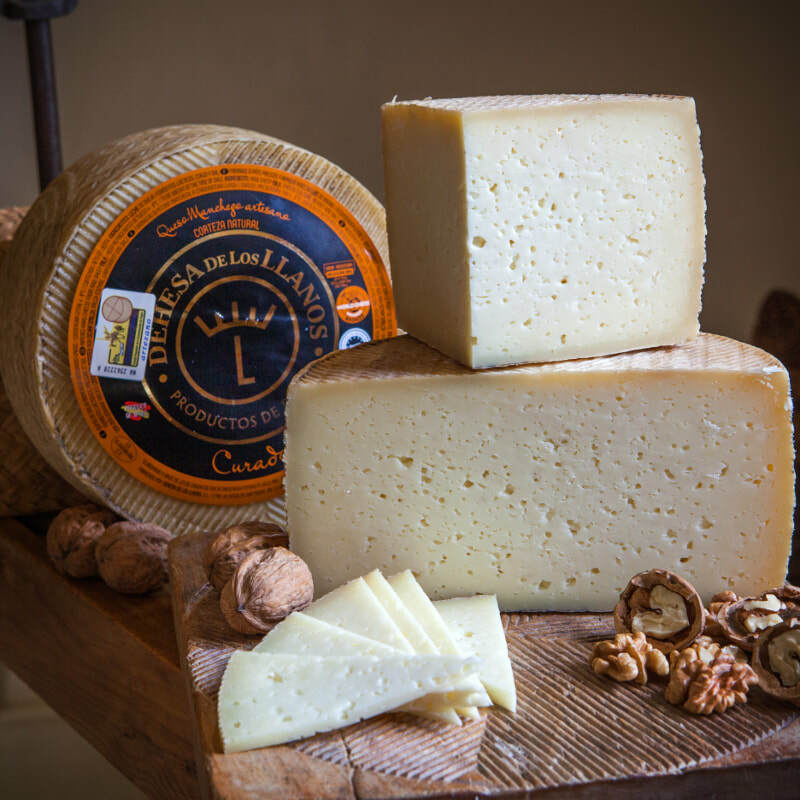 Dehesa de Los Llanos Gran Reserva Cheese: straw-yellow in colour, with a slightly dry texture and intense aroma with rustic reminiscences. It has a distinct, intense and elegant taste, slightly musty. World Cheese Awards: Super Gold 2013, World Champion 2012, Bronze Medal in 2011 and 2010, Gold Medal in 2007. Net weight: 3 portions of 250 g approx each. The winner at the World Cheese Awards in 2012. 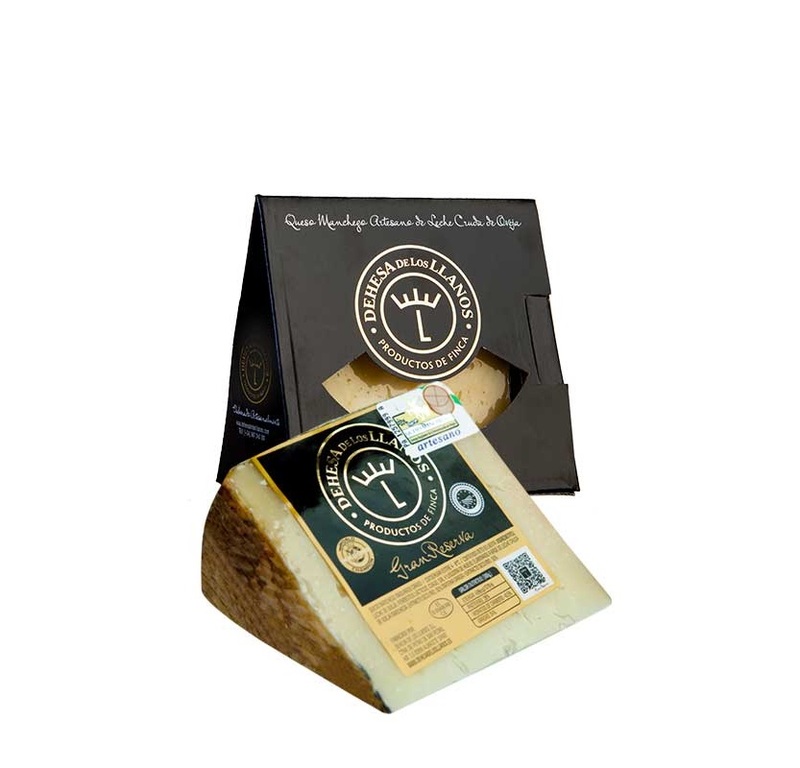 Gran Reserva Dehesa de Los Llanos Cheese is straw-yellow in colour, with a slightly dry texture and intense aroma with rustic reminiscences. It has a distinct, intense and elegant taste, slightly musty. World Cheese Awards: Super Gold 2013, World Champion 2012, Bronze Medal in 2011 and 2010, Gold Medal in 2007. Dehesa de Los Llanos Cured Cheese is an artisan Manchego Denominacion de Origen (D.O.) cheese made with raw milk from the Manchego sheep bred on the Dehesa de Los Llanos estate. It is dark straw yellow in colour with a clean lactic aroma, well-developed, intense flavour and a flaky, friable texture. 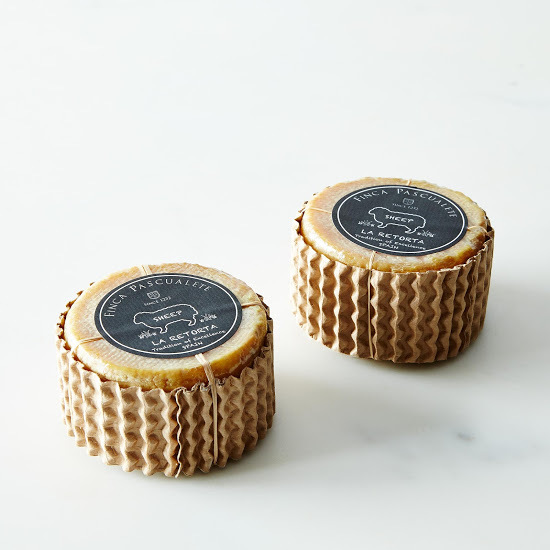 Cured for at least 6 months, the extraordinary cheese is instantly recognizable from its olive oil brushed natural rind that has no colourings or additives added in its production process. 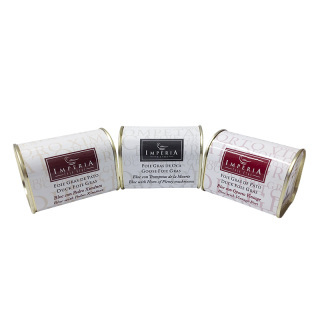 This artisan cheese is a celebrated medal winner at the 2006, 2007, 2009, 2010 and 2014 World Cheese awards. Raw milk cheese from sheep hand pressed. Traditional elaboration. Its flavor is mild but very personal, persistent on the palate, with memories due to field vegetable rennet, and creamy texture, almost liquid, the result of continued daily dump, which melts deliciously in the palate. Super Gold 2011 World Cheese Awards. 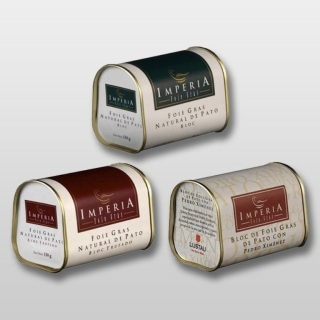 1 Natural Duck Foie Gras Bloc 130 g.
1 Duck Foie Gras Bloc with Truffle 130.g. 1 Duck Foie Gras Bloc with sweet wine Pedro Ximenez Reserva San Emilio de Lustau 130 g.
The blocks of Duck Foie Gras Imperia nature contain 98% of liver duck farms selected in Riudellots de la Selva, Catalonia. It's an excellent foie gras, carefully prepared, the result of a perfect blend of craftsmanship and technological innovation. 1 Duck Foie Gras Bloc with Oporto porto Sandernan Vau Vintage 130.g. 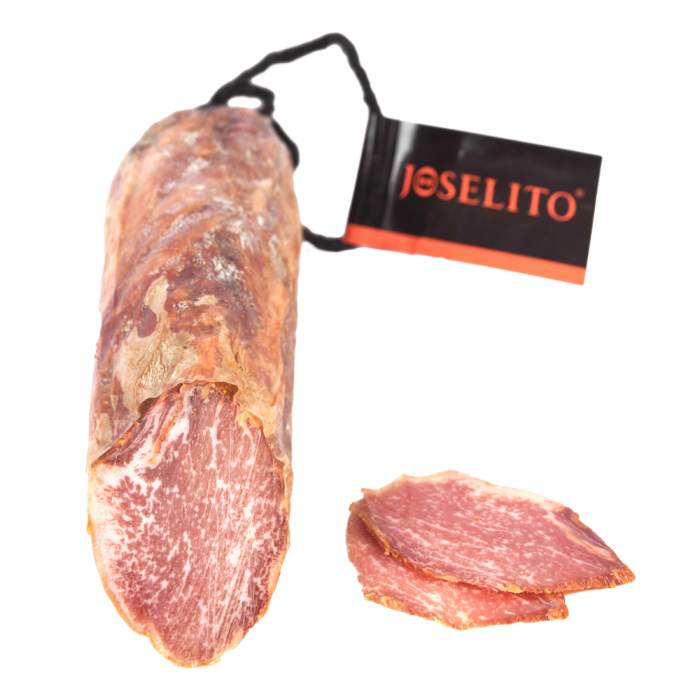 ​According to Basque maestro Juan Mari Arzak and Catalan chef Carme Ruscalleda, Joselito's is "the best ham in the world." 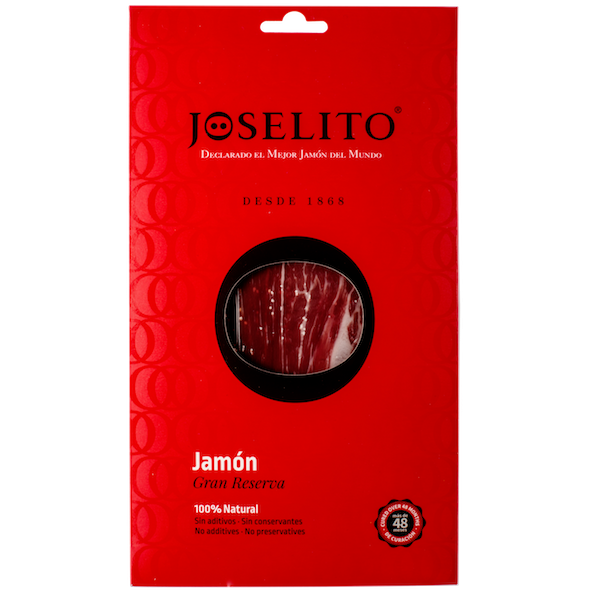 For a greater enjoyment of the organoleptic qualities of the Joselito Shoulder, it is advisable to consume it at room temperature. 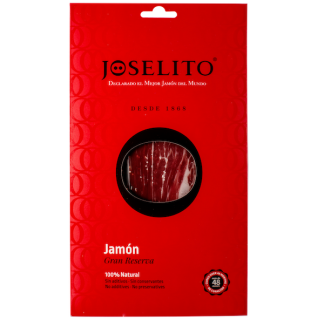 To enjoy the organoleptic qualities of the Joselito Sliced Ham, it is recommended to remove it from the camera at least 60 min before consumption. JOSELITO Paleta Gran Reserva sliced 5x70 g Pack.Cured shoulder from iberian pigs acorn-fed. Tasting notes: the meat flavor is not salty and can be sweet-tasting, with a pleasant and characteristic aroma. The texture is not very fibrous. The coloUr when cut is characteristic, varying from pink to a purplish-red, and the appearance shows fat marbling in the muscle. The fat is shiny, a yellowish pinky-white, aromatic and pleasant tasting, and the consistency varies depending on the amount of acorns in the pig's diet. Made from the best cuts, removed with a knife, marinated and stuffed into colon casings. 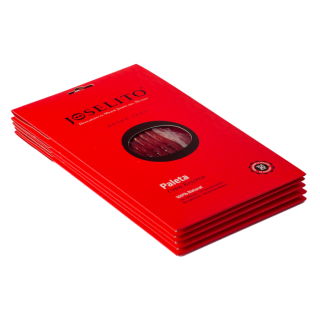 Minimum curing time of 5 to 6 months in natural drying houses and cellars.IngredientsLean meat from bellota-grade Iberian pigs, pepper, salt and garlic. Intense aroma, plump, juicy texture, good balance between lean meat and fat and just the right touch of natural pepper and garlic. Storage: Because it has been vacuum packed, the salchichón should be removed from its wrapping 20 minutes before it is to be eaten to allow flavours to develop. Its ideal appearance, colour and consistency are achieved if it is allowed to air for 24 hours. Once the vacuum seal is broken the product must be removed from its bag. Please store it at between 0 ºC and 5 ºC (32 to 41 ºF). Cured chorizo in natural casing - top ibérico charcuterie is produced by Joselito to the same standards and from pigs reared in the same way as the Joselito hams. 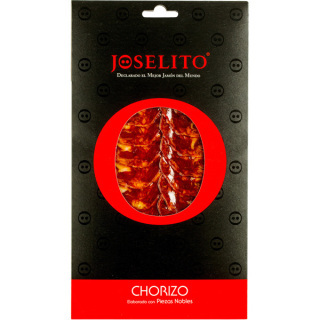 The chorizo is made from high quality pork cuts, mixed with smoked pimentón. This is then packed tightly into natural sausage skins, for a long cure and a full flavour. 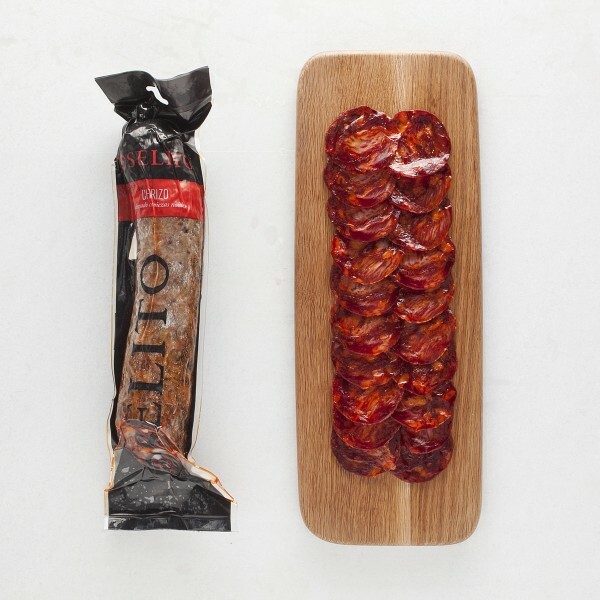 The chorizo is cured naturally, benefitting from the unique microclimate of Guijuelo. Tasting notes: Sweet, nutty and melting a with mild smoky taste. 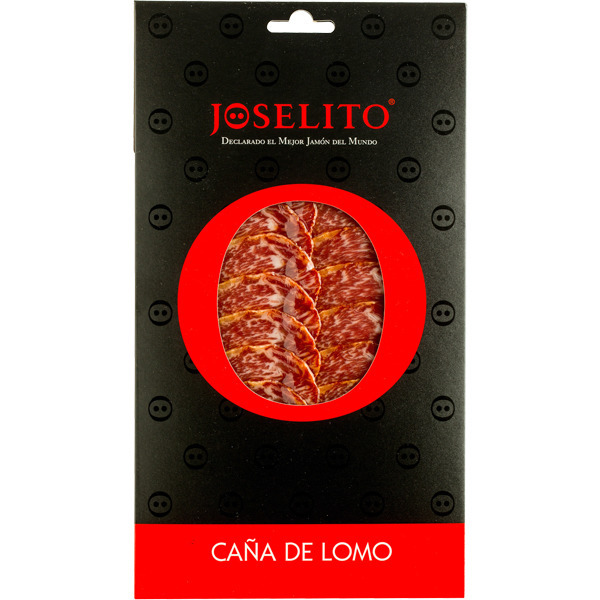 Serve simply as a tapa or as part of an assortment of charcuterie. Another delicacy. This product is the result of the selection of the best and finest pieces of pork meat Iberico. Pure muscle fiber with minimal fat, once flavored with salt, pepper, garlic and oregano to cure it after boot stage. The back has always been regarded as one of the highest quality meats and better taste. 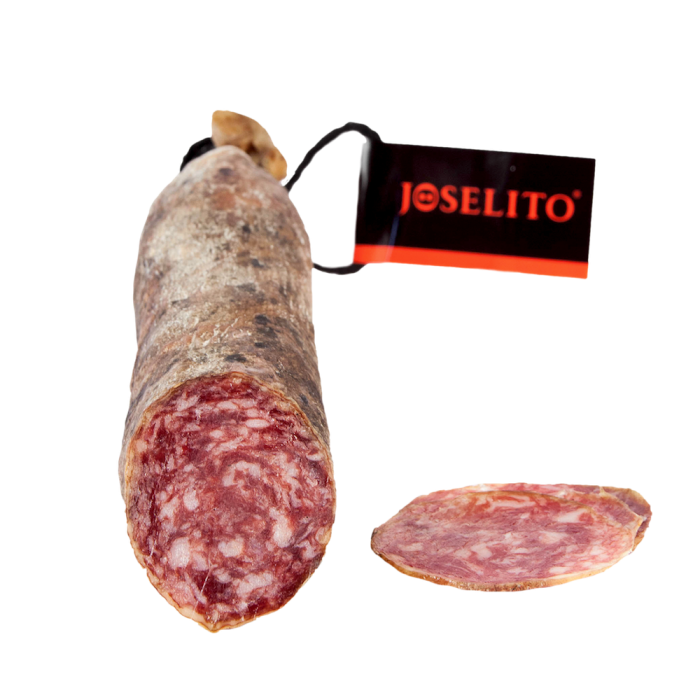 Sausage prepared with select meat from white pigs, fat, salt and black pepper, following the traditional production process in the area of Plana de Vic, with a minimum curing time of 45 days. 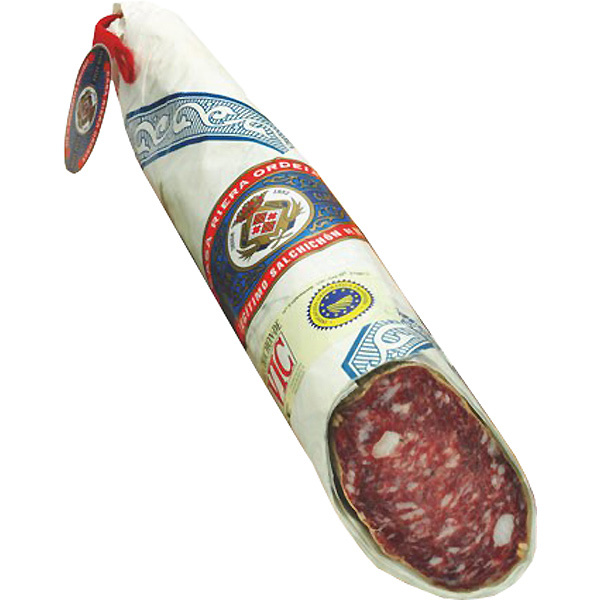 Cylindrical and more or less regular in shape, its external whitish color is due to the flora unique to this sausage. When sliced the interior is reddish, with visible dots of fat and whole black peppercorns. Tasting notes: Mild, pleasant aroma, a delicate flavor and texture, with hints of pepper and a lingering aftertaste. 1.2 Kg approx. A good curing time and production methods passed down over three generations. Typical regional products stuffed into natural casings and left to cure slowly, because only time ensures the smells and tastes of age-old artisan traditions. 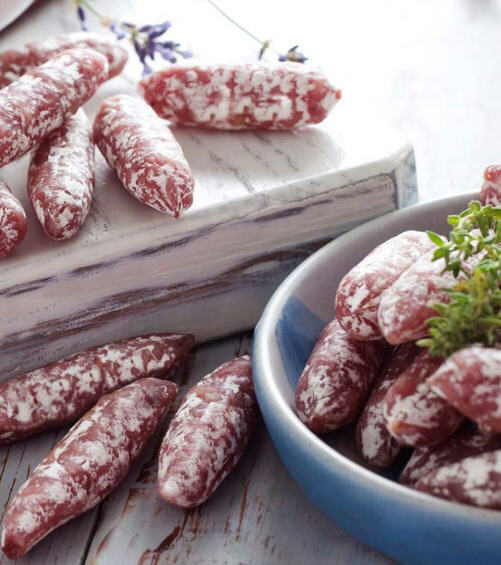 Select aged meats combined with spices and herbs and following century-old family recipes, are subjected to daily controls and care for the many months of the curing process to obtain the most exquisite products. JOSELITO Chorizo Iberico 600 g approx. 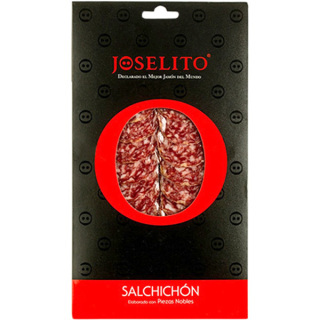 JOSELITO Salchichon Iberico 1 Kg approx. 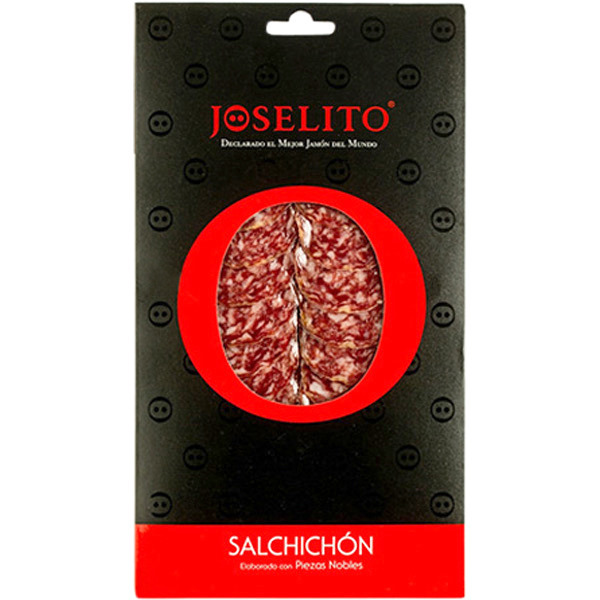 Storage: Because it has been vacuum packed, the salchichón should be removed from its wrapping 20 minutes before it is to be eaten to allow flavours to develop. Its ideal appearance, colour and consistency are achieved if it is allowed to air for 24 hours. Once the vacuum seal is broken the product must be removed from its bag.